The Little penguin is the smallest species of penguin, weighing only one kilogram (2.2 pounds) and ~33 cm (13 inches) tall. Every year during the reproductive season, parents engage on daily journeys to find food for their newborns, and their adventures are witnessed by ecotourists at nature parks that protect the delicate habitat of these native birds. We sat at dusk waiting for the last rays of sun to fade away. The audience was impatient, with whispers going around like a wave. The scene finally became completely dark and we could barely distinguish the horizon. It was an unknown wait, without knowing what to expect or where to look. Suddenly, tiny silhouettes appeared on the horizon. It was the beginning of an amazing night. It was the start of the penguin parade. I visited Phillip Island in Australia in 2013 for the first time and I was tremendously excited to see this so-called “parade.” I had never heard something like that happening in the natural world. The people I asked gave little information. “You will have to see it yourself,” they said. 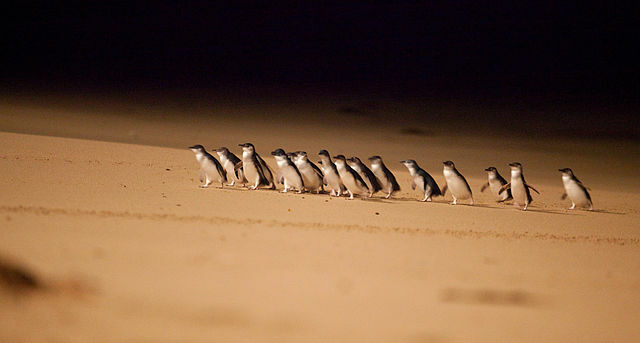 Little penguins will arrive after sunset by the hundreds, sometimes thousands. The time of the arrival could be predicted based on the activity of the day before and the time of sunset. As a bird biologist, I was baffled. Was that really true? Was I expecting a synchronized parade of wild animals in front of our eyes? My doubts grew bigger when I saw the theater-like scenario where people sat. Turns out the rumors were true. Hundreds of Little penguins marched that night in front of my eyes, all in a “coordinated” feeding parade, running through the crevices under us and rushing to deliver food to their babies. Phillip Island is located in the south-southeast of Melbourne, Australia and it holds one of the most important colonies of Little penguins with around 30,000 individuals1. The total number of Little penguins is calculated to be one million and luckily this species is not threatened by extinction. In general, their numbers have remained stable on recent decades2. Little penguins’ favorite food is anchovy and they can rely on it year-round3, especially when they have to feed their offspring. However, the percentage of anchovy that Little penguins eat varies throughout the year3 and recently it has been discovered that they also rely on alternative foods, as they can complement their diet with gelatinous plankton4 and even jellyfish5. Even though their numbers are relatively stable, Little penguins have not escaped the impact of humans. Because these animals live very close to human settlements, they are threatened by growing urbanization and the risk of losing their breeding habitat. 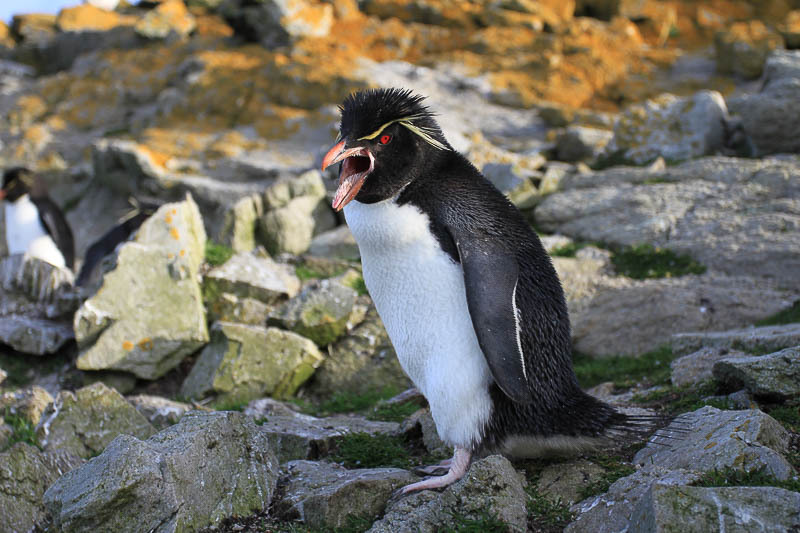 In fact, it is likely that actual colonies hold the last few habitable places for penguins6. As could happen with other fish eaters (including us! 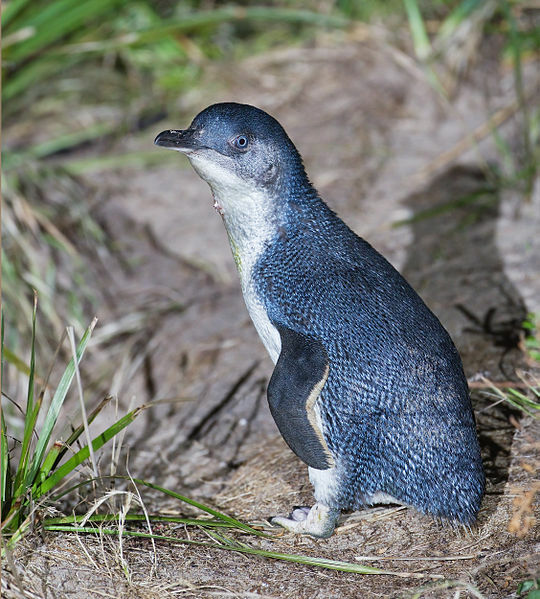 ), Little penguins have been found with high concentrations of heavy metals in their bodies (e.g. mercury, arsenic, etc. ), especially those living in colonies close to human settlements7. Sadly, Little penguins are also victims of introduced species (e.g. foxes), plastic pollution, fishing and increasing warm water events2. Fortunately for many populations of Little penguins, there are many actions in place to protect them and to assure their brighter future. Several protected areas and sanctuaries in Australia and New Zealand have monitoring programs and scientific research that will continue giving us more information about them. Management of tourists has been effective at buffering the negative impacts of human activities. Also, the management of invasive species has been fundamental to keep colonies predator-free as, for example, a single fox could cause massive damage in a breeding colony. Moreover, educational programs targeting schools and general public have been central to promote the conservation of such iconic species. The penguin parade I saw was unforgettable. It was fantastic to watch those apparently little, but nonetheless strong, persistent parents rush back to fulfill their parental duties. I wondered if they were carrying enough food, if those babies were going to make it or if those parents were going to try again next year. Too many single stories to have an answer. Nonetheless, that night I felt optimistic, thinking that as long as they had people caring for them and a protected safe haven in Phillip Island, penguins will keep coming back in the future and more people will get to see them in this unique penguin parade. 2 BirdLife International 2017. Eudyptula minor (amended version of 2016 assessment). The IUCN Red List of Threatened Species 2017: e.T22697805A112478911. http://dx.doi.org/10.2305/IUCN.UK.2017-1.RLTS.T22697805A112478911.en. Downloaded on 09 November 2018. 3 Kowalczyk, N. D., Chiaradia, A., Preston, T. J., & Reina, R. D. (2015). Fine-scale dietary changes between the breeding and non-breeding diet of a resident seabird. Royal Society open science, 2(4), 140291. 4 Cavallo, C. R., Chiaradia, A., Deagle, B. E., McInnes, J., Sanchez Gomez, S., Hays, G. C., & Reina, R. D. (2018). Molecular analysis of predator scats reveals role of salps in temperate inshore food webs. Frontiers in Marine Science, 5, 381. 6 Rastandeh, A., Pedersen Zari, M., & Brown, D. K. (2018). Land cover change and management implications for the conservation of a seabird in an urban coastal zone under climate change. Ecological Management & Restoration, 19(2), 147-155. 7 Finger, A., Lavers, J. L., Dann, P., Kowalczyk, N. D., Scarpaci, C., Nugegoda, D., & Orbell, J. D. (2017). Metals and metalloids in Little Penguin (Eudyptula minor) prey, blood and faeces. Environmental pollution, 223, 567-574. Penguin parade? Did you know they did that? Have you seen one? Let us know. Be sure to read our other penguin blogs, too.